The Dow Jones Industrial Average and the S&P 500 jumped to record closing highs. Tilray Inc. (TLRY slumped more than 20% after taking investors on a crazy ride during the previous session. Amazon.com Inc. (AMZN rose 1% following a report the company is considering a massive expansion of its cashierless stores. The Dow Jones Industrial Average cruised to a record closing high Thursday, Sept. 20, the index's first since January. The S&P 500 also set a record, as investors assessed the risk landscape amid rising bond yields and higher crude oil prices and looked past trade war worries. 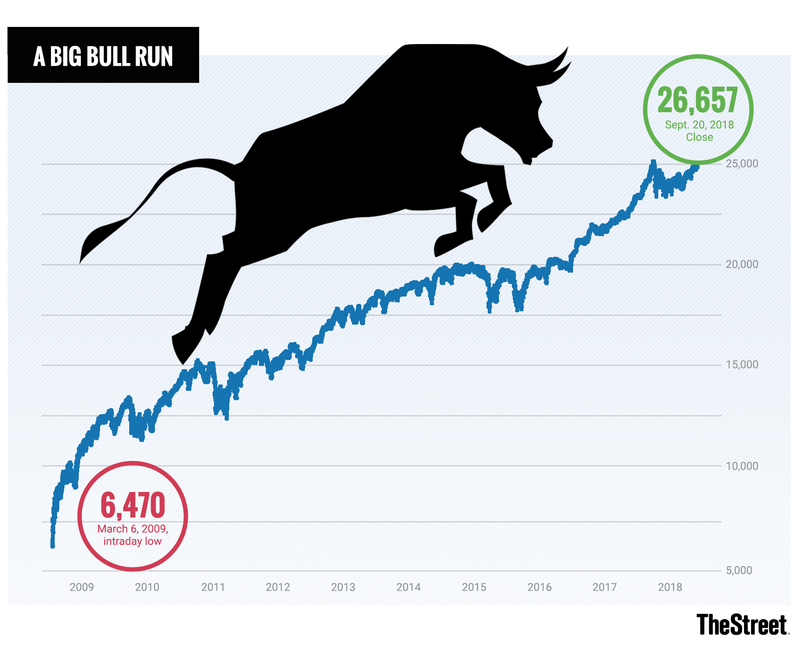 The Dow has risen more than 300% since it bottomed out at 6,470 intraday on March 6, 2009 in the wake of the financial crisis that rocked Wall Street a decade ago. The Dow Jones Industrial Average rose 0.95%, or 251.22 points in to end at 26,656.98. The blue-chip index earlier struck a new intraday record high of 26,697.49. The S&P 500 rose 0.78% to close at 2,930.75; its intraday was 2,934.80. The Nasdaq was up 0.98%. Global oil prices slipped after West Texas Intermediate crude, the U.S. benchmark, earlier crossed $71 a barrel and contracts for Brent crude, the European benchmark, rose closer to $80, following data that showed domestic inventories fell to the lowest level in three-and-a-half years. WTI crude was down 0.3% to $70.88 a barrel. Comcast Corp. (CMCSA , Walt Disney Co. (DIS and Twenty-First Century Fox Inc. (FOX will take their $35 billion battle to own Britain's Sky PLC into a one-day bidding contest that will determine the owner of Europe's most lucrative pay television broadcaster, regulators said Thursday. Comcast and Disney are holdings in Jim Cramer's Action Alerts PLUS member club. Want to be alerted before Jim Cramer buys or sells the stocks? Learn more now. Amazon.com Inc. (AMZN is considering an aggressive plan to open as many as 3,000 new cashierless AmazonGo stores in the next few years, Bloomberg reported, citing people familiar with matter. The online retailing giant, according to the report, is considering plans to have about 10 locations open by the end of 2018, about 50 locations in major metro areas in 2019, and then as many as 3,000 by 2021. The stock rose 1%. General Electric Co. (GE fell 3.2% on Thursday after JPMorgan analysts cut their rating on the struggling conglomerate amid concerns that a key gas turbine launch would hit GE's earnings. Lead analyst Stephen Tusa, who has a underweight rating on the stock, lowered his price target to $10 a share from $11 as he reiterated concerns for the company's power division. Tilray Inc. (TLRY fell 20.12% on Thursday after closing with a gain of more than 38% on Wednesday following an interview the cannabis company's CEO held with TheStreet's Jim Cramer on his "Mad Money" program on CNBC. Brendan Kennedy touted his Canadian cannabis business as a smart hedge for the world's largest pharmaceutical companies. Darden Restaurants Inc. (DRI , the parent of Olive Garden, posted fiscal first-quarter earnings of $1.32, ahead of estimates of $1.24. Same-store sales rose 3.3% in the period, beating forecasts of up 2.1%. The stock fell 1.2%. Software company Red Hat Inc. (RHT fell 6.5% after fiscal second-quarter revenue of $822.7 million and its outlook for the third quarter missed analysts' forecasts. Under Armour Inc. (UAA said Thursday it was revising its outlook for adjusted earnings in 2018 higher but also said it was raising by $10 million the expected restructuring charges related to a 3% workforce reduction. The stock was up 6.6%. Micron Technology Inc. (MU shares rose in after hours trading after the company posted its latest financial results. In U.S. economic data, weekly jobless claims fell 3,000 last week, declining to the lowest level since November 1969.